Each spring, a burst of life begins with some of my favorite wild plants: weeds. Dandelions, violets, plantain, chickweed, and others fill our yards with nutritious and medicinal treats this time of year, as well as again in the fall. Unlike some folks, I let mine grow where they like, harvesting them for salads, pesto, tea, and infused oils for salve making. Below are two of my favorite spring weeds to look out for this coming March and April. Medicinal uses: Both the leaves andseeds of Plantain are highly nutritious foods, chocked full of vitamins and minerals. The seeds also are a rich source of omega 3s. Taken internally, the leaves act as a gentle expectorant, while plantain leaf’s mucilage helps to soothe inflamed and sore mucosal tissues, making it a great remedy for coughs or bronchitis. Its astringent properties also make it a useful remedy for diarrhea and hemorrhoids. Plantain is best known, however, for its topical healing properties. Plantain’s antimicrobial, anti-inflammatory, and vulnerary (wound-healing) properties make it an appropriate plant for many external wounds. Its astringency helps to draw out infection and can be used topically for bee stings, bug bites, bleeding, bruises, cuts, and even blood poisoning. How to use & dosage: For internal use, a tea can be made by infusing 2 tsp of dried or 3-4tsp fresh herb in 8 oz water for 10 minutes. Drink up to 3 cups a day. Tincture dosage is 2-3 ml (70-105 drops)/ 3x day. For external use, plantain can be used as an infused oil, salve, compress, or poultice. To make a plantain spit poultice: Chew up leaf, put on wound, and cover with band-aid to keep in place. Your saliva actually adds anti-microbial agents to the wound! 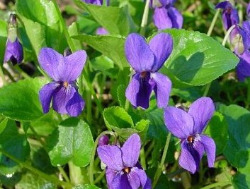 Medicinal uses: There are quite a few varieties of sweet violets (not to be confused with those fuzzy, ornamental African violets!) and they all are edible. Most of us can find plenty of these beautiful little spring flowers growing in our yards, as well as the woods. Both the leavesand the flowers of the violet are loaded with minerals and vitamins, especially Vit. A and C. 1/2 cup of violet leaves has roughly the same amount of vitamin C as 4 oranges! The leaves are considered an alterative or “blood purifier,” which means they gradually restore the body to proper functioning by aiding in metabolic processes, especially the elimination of wastes. Violet leaves have an affinity for the lymphatic glands, helping the body rid itself of toxins and supporting the immune system. Thus, eating violets in the springtime helps gently detox the body. The mucilage, or slimy stuff, in the leaves has a soothing, demulcent effect on mucosal tissues and thus, can help internally to reduce fever and gastrointestinal inflammation, as well as ease coughs. Violets also act as an expectorant and can be helpful for alleviating sinus and lung congestion. Externally, the leaves' antimicrobial and anti-inflammatory properties can be utilized by making a "poultice" or herbal band-aid by briefly chewing the leaves and applying them to a wound or bug bite. Violet leaves can also be extracted in oil and applied externally in salve or ointment form. How to Use: You can receive many of violets' nutritional and medicinal benefits simply through eating them. Try throwing them into your next salad, putting them in your homemade pesto, or making an herbal vinegar. You can also take them as a tea by infusing or steeping the leaves in hot water for 15 minutes. For tea making, I recommend either chopping the leaves up or bruising them before pouring hot water over them to steep. Dosage: There is not a specific dosage for violet leaves or flowers. I tend to just eat a small handful or so as I feel inclined. For making a medicinal tea, I would recommend steeping a small handful of fresh leaves or 1 tsp of dried leaf for each 8 oz cup of hot water and drinking as needed for constipation, congestion, and coughs, up to 3x day.